Why I am dancing in my kitchen? This time it’s not because of Beyonce. My culinary swing is because…I installed the beautiful plantation shutters you see behind me. Myself. Me. And also Saxon. Together. With a drill. 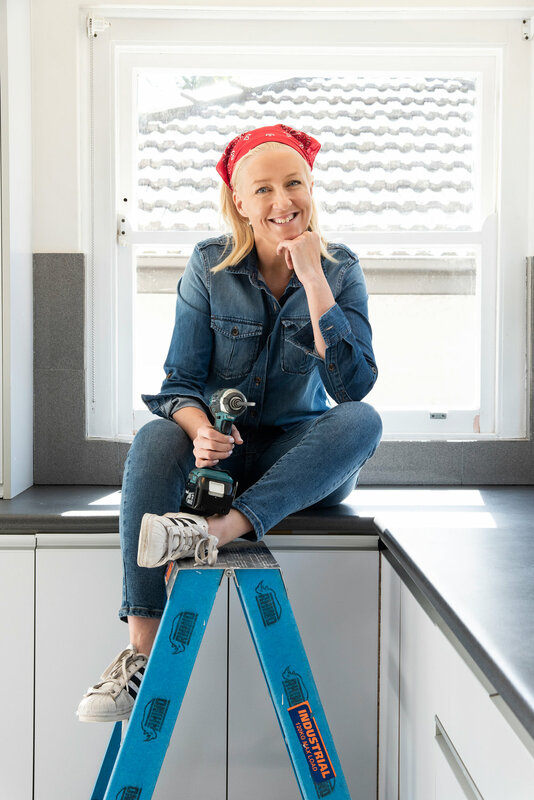 I’m no stranger to renovations - big and small - and along the way I’ve learned little skills that are starting to accumulate into some meaningful ability. Whether it’s baking a cake or hanging a shelf - using your hands, you brain, getting involved...nothing beats the feeling of having accomplished something outside of your comfort zone. This is the only proof you’ll ever need that window dressings can totally transform a room. The blinds in our kitchen could not have been uglier. It was like cooking inside an office block in East London in 1971. Now it’s like cooking in the South of France. We saved SO much money by using DIY BLINDS - an Australian online window furnishing company that are doing things a little bit differently. DIY BLINDS allow you to customise your service. So, you can buy full installation or do the whole thing yourself. By cutting out showrooms and sales commission they’re able to deliver top quality at a much better price. The most difficult part of self-installing any window treatment is the measuring (even builders can get it wrong). We chose to have our kitchen windows professionally measured because they are old and I have never trusted myself with a measuring tape. Check measures only cost $99 (no matter how many windows you need done) and if the product doesn’t fit then DIY BLINDS handle the remake at their cost. I Did. So You TOTALLY CAN too. Nothing feels better than getting rid of ugly window dressings. And these win the prize for hideous. As much as you want to rip them from the walls. It’s important to remove with care. Over zealous removal can cause damage to the window surrounds and create issues when it comes to installing. Most window dressings - curtains, blinds - can be removed with a drill and a touch of elbow grease. You need to use an electric drill. Ok? It really is not hard but looks totally impressive. For install you’ll need a cordless drill and a 3mm drill bit. The shutter installation requires very little drilling. Really it’s just the frames and the brackets. Once you’re used to the weight and the speed of the drill you’ll be totally fine. Just dress like you know what you’re doing. The shutter frame will come in three or four pieces depending on your window. Place them on the floor (any clean/hard surface) and then clip into place using the Hoffman Key provided. Each section is labeled so you match the correct hinge and panel. Mount & Secure Your Frame. This is where it becomes a two person job. So Saxon joined the DIY party - we both look like we’re dressed for a hoe down?! - and he helped me carefully lift the frames into position. We chose recessed shutters which means we needed to pre-drill eight small holes on the window facing side of the frames. Once the frame is in place secure with the provided screws. This is the fun part. Once your frames are secure, attach your shutter panels using the hinge pins provided. Just make sure that the bracket and the panel match up - if not switch it out until you have the right fit. Once you’ve hung the panels you need to make sure they open and close. You may need to lift them in and out of the frame to get them moving smoothly. Or tighten or loosen a screw to square them into place. But if you have done everything right up to this point - you’ll look like me in this photo. Happy. Three Top Style Tips From Rachel Zoe.